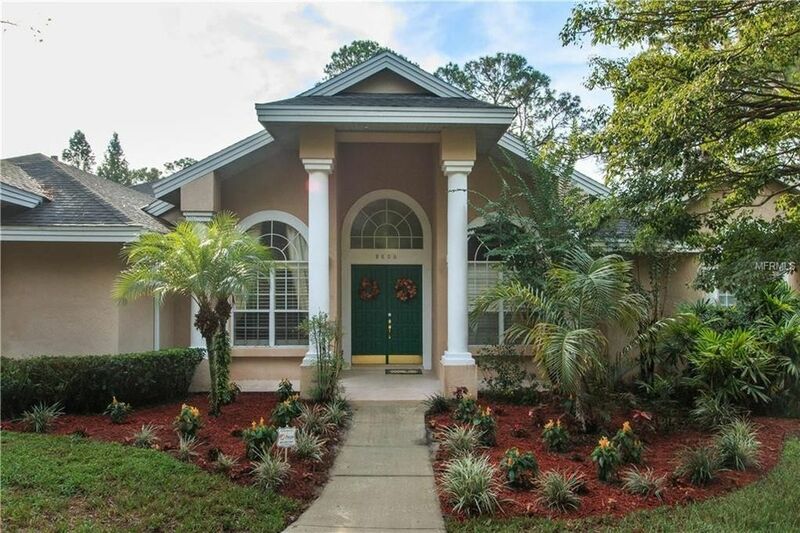 REMARKABLE 4 BEDROOM/3 BATH POOL HOME ON 1/2 ACRE WITH SUPREME LOCATION, SUPREME FEATURES, AND SUPREME SCHOOLS AND SHOPPING. Extra large 1/2 acre lot and fenced in back yard with delightful tropical pool with oversized lanai overlooking brand new diamond-brite pool remodel! Acrylic deck freshen up and elevated screen cage with new screen all contained in an atrium style oasis with entry from the family room, living room & master bedroom sliders for those late night therapeutic spa visits! BRAND NEW FLOORING & CARPET THROUGHOUT! KITCHEN WAS REDONE WITH CHERRY CABINETRY AND GRANITE COUNTERTOPS RECENTLY, AND INTERIOR WAS RECENTLY PROFESSIONALLY PAINTED. Both A/C HVAC heat-pump systems just went through a rigorous Fall cleaning and check-up and coils and condensers passed with flying colors and are ready to economically comfort your palace this wintertime! If that doesn't toast your buns well enough, enjoy the Fireplace kitchen-side within the family room that overlooks the backyard, pool area and dinette area with room to seat six! Split plan design and vaulted and raised ceilings add to the appeal and comfort of this unique home! Formerly a TP Model home, this one has ultra wise floorplan & features that were thought of well in advance prior to the build. Elevation, terrace levels and pre-wires for CCTV to name a few. Circular drive with side entry garage and mature landscaping await your visit! HOME WARRANTY INCLUDED! REMARKABLE PRICE FOR TOREY PINES AT THIS SIZE & CONDITION, AND WITH LOTS OF UPGRADES! Driving Directions: I-4 to Conroy Windermere Rd Exit. Turn Right-West. Left-South on Apopka-Vineland Rd, Left into Torey Pines on Torey Pines Terrace. Home on Hill on the Right.